Mango being the seasonal fruit, people tend to forget its benefits and just get busy enjoying the juicy fruit. Mango being the king of fruits, sticks to its order by having numerous health benefits. So, here’s why you should eat at least 1 Mango every day. The fibrous part of mango helps in digestion. Mangoes are loaded with enzymes which help to break down proteins in the body. It is rich in pre-biotic dietary fiber, vitamins and minerals aid to prevent constipation and promote regularity and a healthy digestive tract. It has a high amount of Vitamin C, Vitamin A and various amounts of copper, calcium, vitamin B-12, iron, potassium and magnesium which amps up our immunity and thus keeps us healthy. Fresh mango pulp is a rich source of potassium, which is an essential component of cell and body fluids to help control heart rate and issues of blood pressure. It also contains a high level of vitamin C, pectin, and fibers that help to lower cholesterol levels. So a Mango a day helps to keep your Cholesterol level in check. 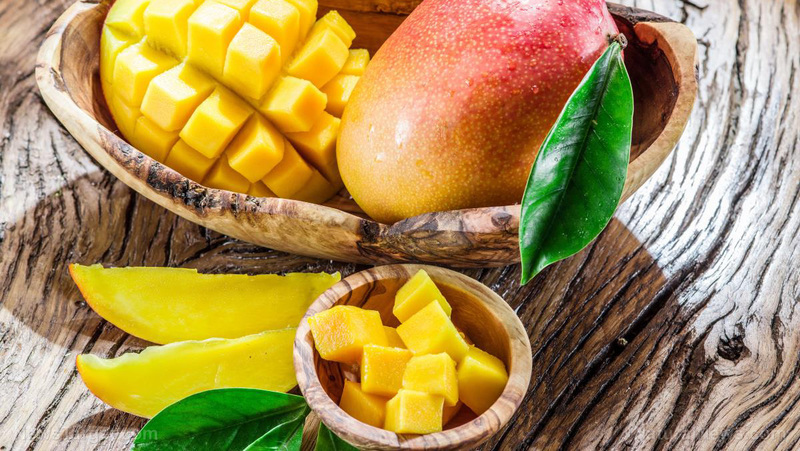 Mangoes are full of antioxidants and abundant enzymes that prevent many diseases including cancers- breast cancer, prostate cancer, colon cancer and leukemia. It is rich in vitamin A. One cup of sliced mangoes fulfills your daily value need of 25 percent of the vitamin A. This nutrient is ideal dose in promoting good eyesight while preventing night blindness and fights dry eyes. It is known to prevent strokes during excessive heat. Mangoes control the levels of homocysteine in the blood, which is harmful to blood vessels that are known to cause CAD and stroke. Mangoes are good for your skin too as they reduce dark spots, blemishes, and acne, thus imparting a natural glow to your skin. Vitamin A and Beta-carotene in this fruit rejuvenate and revive your skin. Not just the fruit but mango leaves are healthy too as they help to normalize your insulin levels in the blood. Boil 5-6 mango leaves in a vessel, soak it through the night and drink the filtered portion in the morning. This helps in regulating your insulin levels. For people suffering from diabetes, should use this traditional home remedy. So what are you waiting for? Have your Mango slices this summer to have all the above health benefits before the King of Fruit waves goodbye to us.